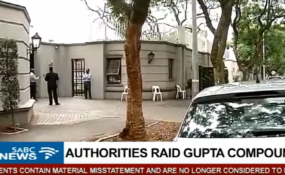 The April 16 raid on the Gupta compound in Saxonwold. The Hawks are investigating cases related to the Guptas' state capture project that involves more than R40 billion which has been plundered from state coffers. Lieutenant General Godfrey Lebeya presented the Hawks' progress in several cases of state capture to the Portfolio Committee on Police on Wednesday. He also shed some light on other high-profile investigations, such as those against Steinhoff and VBS Bank. No suspects have been identified yet in the Hawks' investigation into Gupta-led state capture at Transnet worth R38,6bn - the largest amount of money allegedly looted in a case currently under investigation. The case relates to the procurement of 1 064 locomotives, of which 465 are diesel and 599 are electric. The Hawks are investigating fraud, corruption and money laundering. It is alleged that a Transnet Special Board Committee ceded its powers to a sub-committee to approve the tender. "The tender was then awarded to Bombardier and China South Rail, [which] then inflated the price. They have failed to deliver. However, the state funds were paid," reads Lebeya's presentation to the committee. The Hawks conducted a search and seizure operation on the Bank of Baroda on June 8, 2018. Forensic firm Gobodo is appointed to assist with the analysis of the financial flows with the Hawks' financial investigators. Six Section 205 subpoenas have been served on banks and Transnet, and six witness statements have been obtained, as has information from the Companies and Intellectual Property Commission (CIPC). The South African Reserve Bank (SARB) is also considering a report regarding frozen funds. The Hawks are also investigating fraud, corruption and money laundering relating to Eskom's pre-payment to Tageta for purchasing Optimum Coal Holdings with R659 558 079.38, which was facilitated by the Bank of Baroda. The case also involves the misuse of the Rehabilitation Trust Fund of the Koornfontein Fund in the amount of R280 million that was transferred to a Bank of Baroda account. A further R1.47bn from the Rehabilitation Trust Fund was also transferred to a Bank of Baroda account.The total amount involved is R2.4bn. "Three natural persons and companies have been identified [as suspects] so far," reads the presentation. The Hawks received information from 767 bank accounts as a result of Section 205 subpoenas and 3 800 sources of information are under assessment, while 33CIPC documents have been received, also after the serving of Section 205 subpoenas. PriceWaterhouseCoopers (PWC) are analysing these documents. Eskom has provided more than 1 800 pages of documents with the relevant witness statements. More than 40 witnesses for the initial phase have been identified and must be interviewed. The Hawks are investigating another Eskom-related case of fraud and corruption, involving R396 million. On June 22, 2017, a case of fraud and corruption was reported against a "certain company" which had received contracts and or tenders from Eskom "through alleged influence of a former acting CEO of Eskom". "One of the directors of the benefiting company is related to the acting CEO." "The case is currently under investigation." The Hawks have five people and one company as suspects in a case of fraud, corruption, money laundering and the contravention of the Companies Act in relation to alleged wrongdoing by Systems Applications Products (SAP). SAP SA was awarded contracts by Transnet and Eskom to provide information technology software packages. The company paid Global Softech Solutions and CAD House commissions of R7.4m and R99m to procure the sale of software and services to Eskom and Transnet. A search and seizure operation was conducted on SAP SA. Seven Section 205 subpoenas were served on banks of which all information has been received. The Hawks' financial investigators are analysing these documents. Two CIPC statements have been received, as well as a report from the Financial Intelligence Centre (FIC). "The investigation is continuing," Lebeya said. The SARB reported a case relating to a company called HOMIX that allegedly was used as a conduit for money laundering for what Lebeya called a "certain family" - the Guptas. "A number of companies transferred large sums of money to HOMIX, [which] then transferred large sums of money to two companies in Hong Kong," Lebeya's presentation reads. Six witness statements have been obtained, three banks provided information after Section 205 subpoenas were issued. The Hawks is investigating fraud, corruption and money laundering, involving R284m. "A company known as Estina entered into an agreement with the Free State Department of Agriculture to establish, implement and manage a dairy project in Vrede, in the Free State to benefit previously disadvantaged persons and uplift the people of the Vrede area," reads Lebeya's presentation. "In terms of the agreement, Estina was to provide a capital injection of R228m which never happened." "The said amount was transferred to the Bank of Baroda, and thereafter paid to Oakbay Investments, other different companies and individuals and not the Vrede Dairy Project. "These latter companies and their directors did not have any business relationship with Estina or the Vrede Dairy Project." As a result of Section 205 subpoenas, 302 bank account reports have been obtained. The statements of 139 witnesses have been obtained. Two search and seizure operations have been conducted and an auditing company have been procured to analyse the flow of funds. The seven accused - Mbana Peter Thabethe Seipati Dhlamini, Takisi Jankie Masiteng, Kamal Vasram, Ashu Chalwa, Nazim Howa and Varun Gupta - are out on bail and are to appear in court on Friday. Opposition MPs raised their concern that politicians - former Free State MEC for agriculture, former minister of mineral resources and current ANC backbencher Mosebenzi Zwane, as well as former Free State premier Ace Magashule - weren't being prosecuted. Gupta-associate Duduzane Zuma, son of former president Jacob Zuma, is accused of three charges - the contravention of the Prevention and Combating of Corrupt Activities Act (PRECCA). "The allegations are that certain persons were offered a position of Finance Minister by three individuals who are not constitutionally empowered to do so with the possible expectation of gratification." The Hawks obtained 20 witness statements and served four Section 205 subpoenas. "The presence of Mr Duduzane Zuma was secured in court and he is out on bail," Lebeya said. The matter is postponed to January 25, 2019. Some ANC MPs and EFF MP Philip Mhlongo took issue with the fact that Zuma appeared in court in shackles, while he was not accused of a violent crime and handed himself over to the authorities. Police Minister Bheki Cele said the police and the National Prosecuting Authority asked that he not be shackled, but the specific court insisted on using shackles as they do on all accused. The Hawks is investigating a case of the alleged contravention of PRECCA. "It is alleged that Sahara Computers, which is associated with a certain family (the Guptas) paid for trips and accommodation to Dubai and India and municipal accounts for the then chairperson of Denel." "VR Lazer Company which is associated with the same [Gupta] family, would have entered into a joint venture with Denel to form Denel Asia. "National Treasury intervened and the venture did not materialise." There is one suspect to date. The Hawks obtained evidence through two Section 205 subpoenas from the banks, but five witness statements are still outstanding.